Turns out, evidence backs up your grandmother’s cure-all for tummy troubles. Here’s why, and some more tips to feel better when you have a stomach ache. The “I’m about to puke” feeling is one of the worst feelings, right? We’ve all been there: the aching belly, nausea, diarrhea and vomiting. But is there any proof that those work? Family medicine physician Matthew Goldman, MD, offers five tips for how to feel better when your stomach is in the pits. Studies have shown that ginger root is effective at alleviating nausea and vomiting. What’s more, ginger has anti-inflammatory, antioxidant, antitumor and antiulcer effects. It’s a fake! Ginger ale may not contain natural ginger. It could be an artificial flavoring. 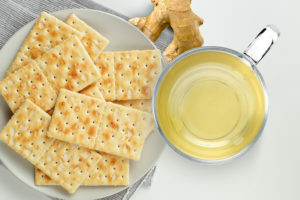 Too little ginger: If it does have real ginger, it may not have enough to offer significant relief. Dr. Goldman suggests reading labels to ensure you’re getting less sugar and enough real ginger. Your best bet? Ginger root from the grocery store. Peel it and mix with decaf tea or warm water. Ginger candies or lollipops (preferably low-sugar). Foods that contain ginger (like low-sugar gingersnap cookies). Soak up some of the irritation-causing acid that sits in an empty stomach. Prevent acid being released in the stomach (heavier foods tend to cause more acid production). Are less likely to trigger nausea because they are odorless. Contain salt to help replace lost electrolytes. Fluids are important when you have a stomachache, especially if you need to replace fluids lost through vomiting and diarrhea. Choose clear liquids in small amounts. Dr. Goldman also suggests oral electrolyte solutions rather than sports drinks. They have electrolyte concentrations that more closely resemble what our bodies need, including minerals like potassium and magnesium. Spicy or smelly, such as pizza, onions and salsa. High in fat, such as fried chicken, sausage, bacon and roast beef. Acidic, such as coffee, orange juice, tomato juice and alcohol. Sweet, such as sodas and sports drinks. Give your body a few days to recover from stomach woes. If it’s a stomach virus, it will pass on its own. Similarly, stress, motion sickness or something you consumed (like food, medicine or alcohol) could be causing your symptoms — but these too shall pass. See blood in your vomit. Notice other changes in your bowel movements.